The Basecamp is built in traditional Airstream Trailer fashion. It’s all hand-made with 100 percent all-aluminum construction, plus its hand riveted with I-beams. The interior is big on space with new design cues throughout. Futher, while compact on the outside – measuring a little more than 16 feet in length and a width of seven feet – the interior is big on space with new design cues throughout. For instance, according to Melton, the most unique feature is the convertible lounge, sleeping and dining area. It can transform into a comfortable living area by day with a dinette and lounge, then to a large sleeping area at night. Optimum ventilation, plus hot water and cabin heating systems are additional appointments. Another new design on the Basecamp is a wet bath. “The Basecamp has a head with some more unique features,” says Melton. “It’s a wet bath but without a shower curtain. Instead, the door to the bath is sealed. So, when the door is closed the seal allows users to take a shower without having to worry about water or a shower curtain moving around.” A shower caddy, master showerhead, and china toilet are also included. A bed that can fold out to a single or one large sleeping area. A comfortable dinette area with swivel table. The Basecamp introduces two optional tent systems to expand living space. 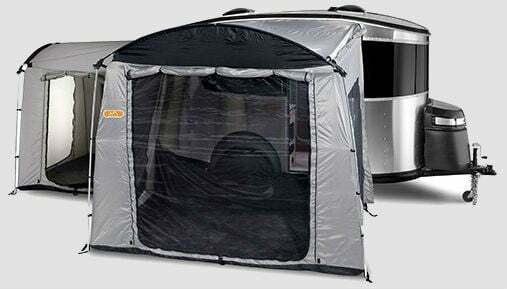 What’s more is the Basecamp introduces two optional tent systems to expand living space. 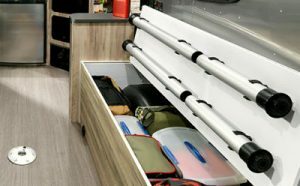 For example, the tent attaches to the door-side or rear of the trailer that combines to offer an additional 120 square feet to sleep, lounge, or store gear. The system is also waterproof and seals tightly up against the unit. 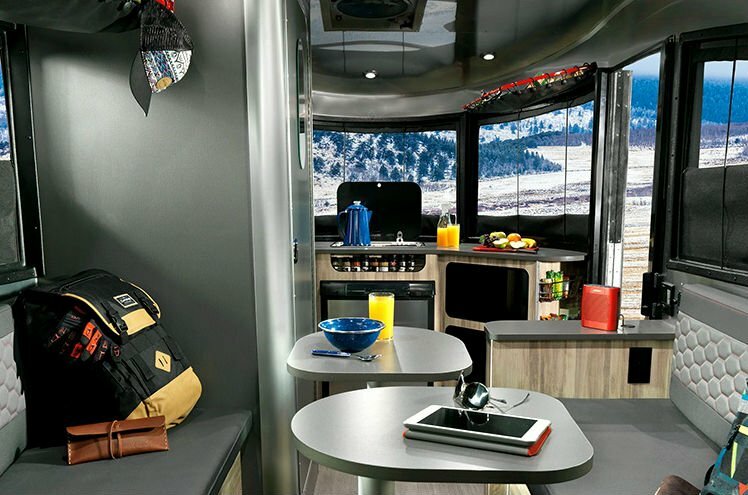 In addition to the interior and exterior features, the Basecamp is built in traditional Airstream Trailer fashion. It’s all hand-made with 100 percent all-aluminum construction, plus its hand riveted with I-beams. It also incorporates the same insulation as current models in the Airstream trailer line. Net Carrying Capacity: 915 lbs. Fresh Water Tank: 22 gal. Black Water Tank: 29 lbs. Storage can also be found throughout. Many living appointments include a laminate galley top. 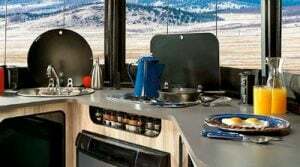 What is the price of the Airstream Basecamp? The price on the Basecamp is $34,900. I had a look at a new one at the Hershey RV show. It appears to be a very nice unit with quality finishes. I’d like one, I’m a long time tent camper and it would be nice to get off of the ground without spending a fortune. My wife on the other hand seeks more creature comforts, like the Flying Cloud parked along side. Decisions?? I hope Air Stream has good success with this unit. It’s a winner. Is there a dealer in San Diego County? Will the Basecamp be available with a larger rear door to accommodate ADA? awesome. but i am going to wait to see how they do before buying one. Is the Roof Aluminum? Can you install Solar or Bike Racks on it? 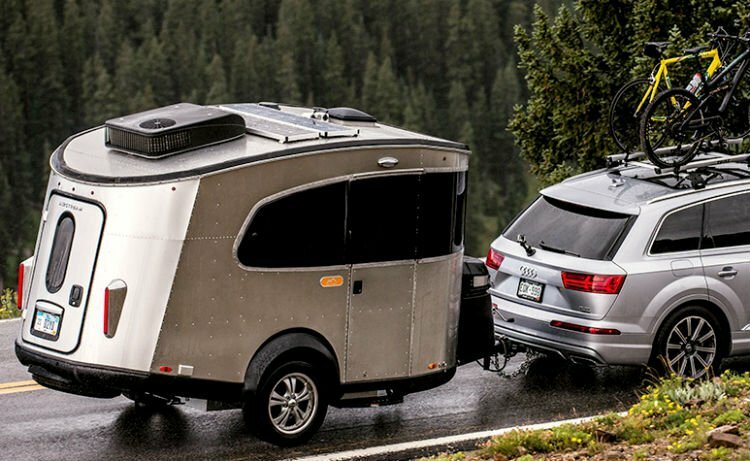 The Basecamp is 100 percent all-aluminum construction. We suggest speaking with your local dealer about bike rack options for the Basecamp. Whoa, a motorcycle helmet you can live in! Is this a new Base camp version? I thought the Basecamp has been around for awhile. Yes this is a new Basecamp version. The previous model was introduced in 2007.This of course has many upgrades and newer appointments. Where can I see and (possibly) buy one in Indiana? You have a few options. 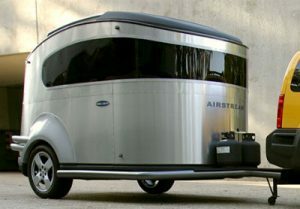 You certainly reach out to Airstream to inquire about availability by contacting sales@airstream.com (which is your best bet) or contact Fort Wayne-based Berning Trailer Sales (http://www.bernings.co/services/trailers). You can also visit one of the winter or spring shows in Indianapolis, South Bend or Fort Wayne this January and February. Is there a dealer near Fairfield, CA, 25 miles south of Sacramento? Thx! There is a dealer right in fairfield. The last one was a actual toy hauler. I can’t load my motorcycle into this. Yeah, it appears the “improvements” are for creature comfort, to the detriment of toy hauling. I’ve found a few other toy haulers online, but they’re just the typical ugly aluminum/plywood box types. What are the dimensions for the biggest bed area?